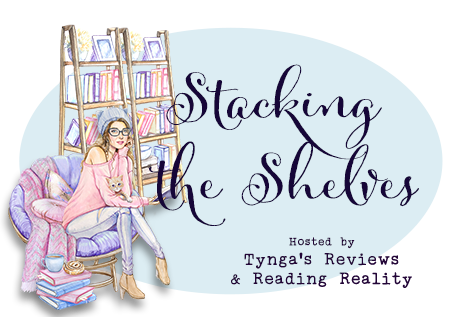 Stacking the Shelves – Escape Reality, Read Fiction! Audible was having a sale. A whole bunch of really interesting audios for $5 each. I had to restrain myself! A couple of books that I’ve been waiting for popped up on NetGalley and Edelweiss. It was a good and interesting week for new books. I always look forward to Diesel’s adventures (The Cat in the Stacks series). The covers, which feature the handsome fellow, always make me smile. And last but definitely not least, my Annual Blogo-Birthday Celebration starts on MONDAY! Not so huge this week. I’m hopeful that this will be the new normal. There’s a book in this stack that I want to start YESTERDAY and I can’t. I have too many in the queue that are due immediately. But I want, I want, I want to read Wolf Rain SO BAD! There’s a part of me that is afraid, very afraid, that the stacks for the rest of the year are all going to look like this. I have things for my committee, things to review for the LJ and thing that just looked good. And I have a lot of them. This very tall stack is the last – but far, far, far from the least – of the ALA Midwinter fallout. Hopefully I’ll be back to the usual dozen or so books next week. Putting this together is a monster! Also, inlinkz has unfortunately dropped their “classic” version, so the link up is a bit different. If you have a comment about how the linkup works now, please let me know. Not that I can change what inlinkz does, but I can look for different service to accomplish the same thing. The Mage-Fire War (Saga of Recluce #21) by L.E. Modesitt Jr. I am doing this super early this week. We’ll have just gotten back from another trip sometime in the wee hours of this morning, and I hope to goodness I’m still sleeping while you read this. I’m still processing the post-ALA fallout onto my shelves, and this post is MUCH easier to prep from my desktop computer – where I have two monitors. I’ve done it from my laptop, trying to pretend that my iPad is the second screen, and it sorta/kinda works, but not for a haul this big. It’s beginning to feel like I’m going to get the post-ALA Midwinter fallout processed just in time to deal with the post-ALA Annual fallout, and that doesn’t happen until the end of JUNE! This is still mostly ALA fallout. Or fall in. Or books falling on my virtual shelves. However one wants to frame that. I’ll be dealing with this fallout for at least a couple more weeks. It’s a good thing this stuff is 99% ebooks, or the UPS person would totally hate me!